← Flower ants? Check again! During my most recent visit to Argentina this past February and March, I had the chance to go behind the scenes and visit the entomology collection at Fundación Miguel Lillo, Instituto de Entomología, Tucumán. It’s always a treat to visit any entomology collection—public or private—at any location. When the collection has holdings of Buprestidae, so much the better. 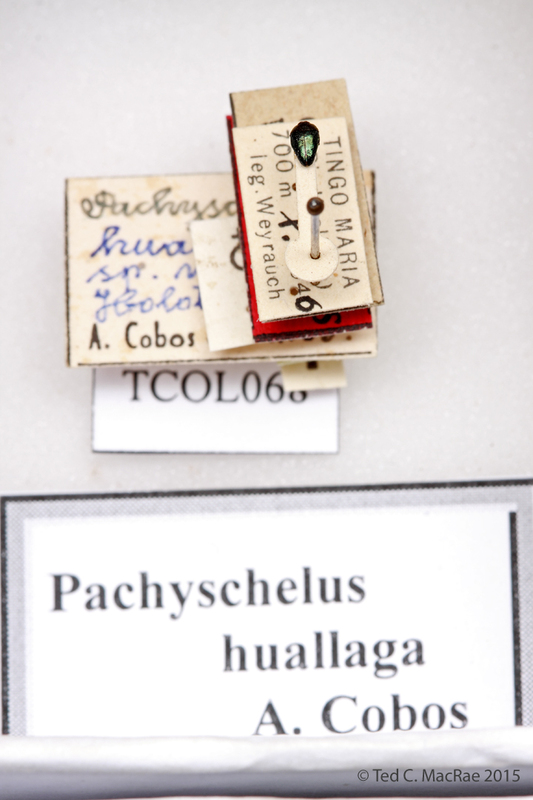 Much to my delight, however, this collection not only had holdings of Buprestidae (not surprisingly representing primarily Argentine species), but also a small collection of type specimens designated by Antonio Cobos Sanchez (1922–1998). 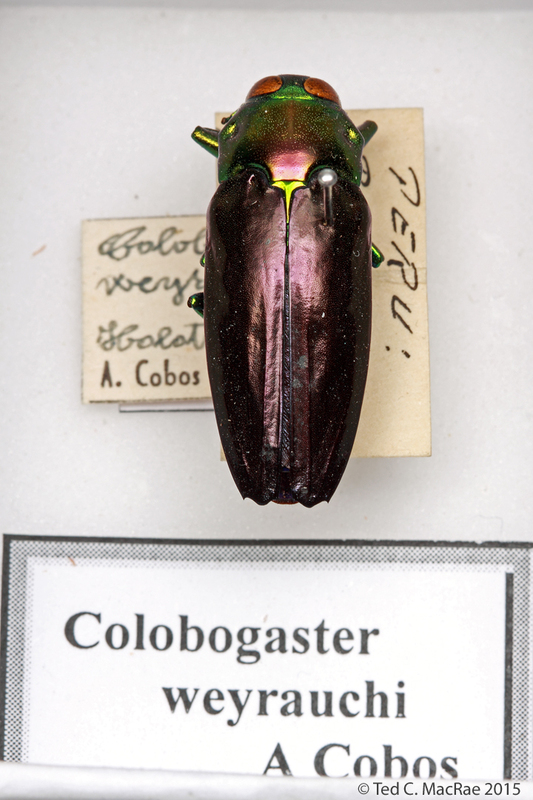 Cobos was one of the 20th century’s most prolific students of Buprestidae, with publications in the family spanning the period from 1949–1990 (coincidentally, 1990 being the year of my very first buprestid publication!). I was graciously allowed to photograph these specimens, some of which present interesting nomenclatural situations that are worthy of comment. These are presented below with my notes. Looking at the insect collection at Fundación Miguel Lillo, Argentina. Tylauchenia golbachi Cobos, 1993. The species was moved to the genus Ocypetes. Lapsus calami or mislabeled type specimen? 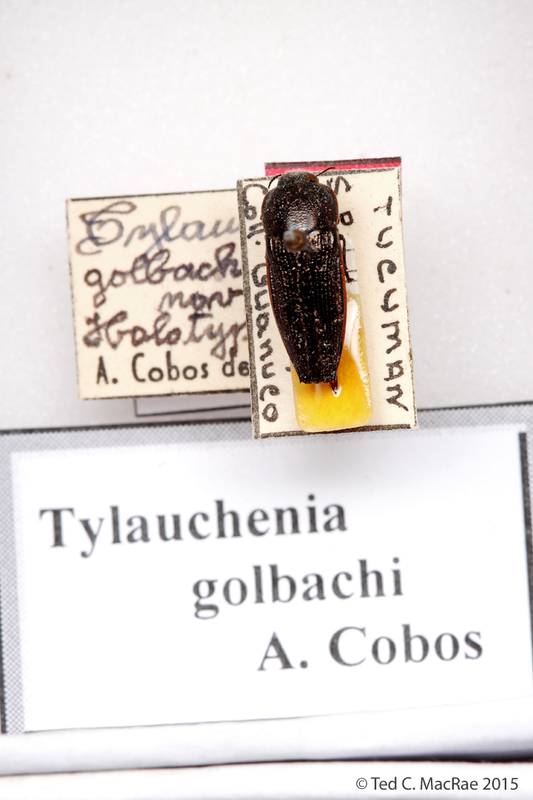 Cobos (1973) described Tylauchenia golbachi from Argentina (now placed in the genus Ocypetes), stating the type locality as “6 kms. N. de Belén, 1.240 m. alt., Catamarca, Argentina (Willink, Terán y Stange coll., con trampa de Malaise, 1-15-I-1970…)”. The specimen above bears the holotype label, but the locality label clearly shows that it was collected in Tucumán rather than Catamarca and that the collector’s name is Guanuco rather than the above stated names. Interestingly, in the same publication Cobos gives the allotype female collection data as “San Pedro de Colalao, Tucumán, Argentina (Coll. Guanuco, 9-III-1949)”. At first I thought this might actually be the allotype rather than the holotype; however, 1) the specimen clearly bears a holotype label, and 2) it is also clearly a male based on the dissected genitalia preserved on the label below the specimen. There are two possible explanations, both of which make it difficult to determine what is the true type locality: 1) the holotype and allotype specimens are correctly labeled, but Cobos simply transposed their label data in his publication describing the species, making Tucumán the true type locality, or 2) the holotype and allotype locality labels were switched at some point and the true type locality is Catamarca, as stated in the publication in which the species is described. This latter possibility is more serious, as in addition to the doubts it generates regarding the type locality it also raises concern about the integrity of the holotype specimen. The latter explanation, however, seems less likely, as it is more difficult to imagine a scenario where only the locality label but not the others was switched than to imagine a transposition of label data in the publication. Sadly, at this point, there seems no easy way to determine which of the two explanations is correct. A manuscript name? Cobos never actually proposed a subspecies “monrosi” for Lampetis tucumana (Guérin-Méneville & Percheron, 1835) (the name on the separate box label is misspelled). He did use the name for two other buprestid taxa: Tetragonoschema monrosi Cobos, 1949—now regarded as a synonym of T. argentiniense (Obenberger, 1915), and Anthaxia monrosi Cobos, 1972—now placed in the genus Agrilaxia. 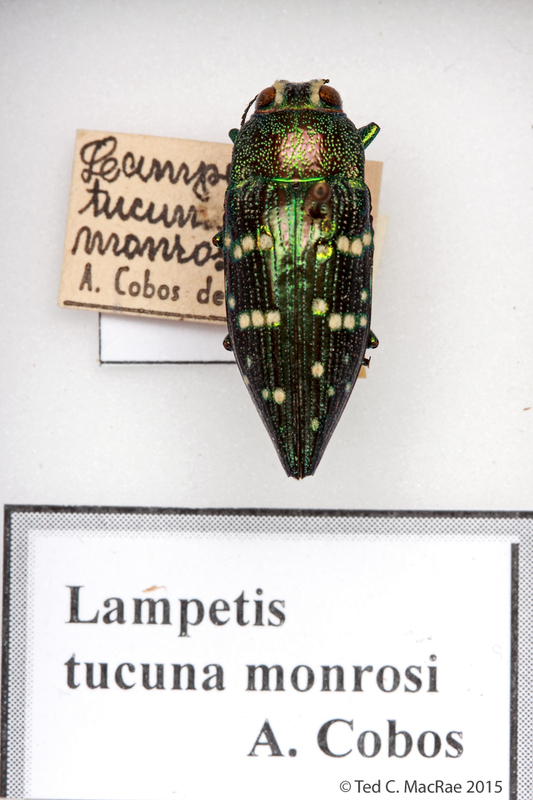 The holotype label on the specimen clearly states “Lampetis tucumana monrosi” in Cobos’ handwriting, so one can only presume that Cobos had identified this specimen as representing a distinct subspecies but never followed through and actually described it. Psiloptera (Pseudolampetis) fasciata metallica Cobos, 1969. Pseudolampetis was later considered a subgenus of Ectinogonia but is now regarded as a full genus. Oh, what a tangled web we weave! Cobos (1969) originally described this taxon as a subspecies of Psiloptera (Pseudolampetis) fasciata Kerremans, 1919. Moore (1986) moved Pseudolampetis to a subgenus of Ectinogonia, which resulted in two taxa in the latter genus bearing the name “metallica“—Ectinogonia (Pseudolampetis) fasciata metallica (Cobos, 1969) and Ectinogonia metallica Fairmaire, 1856—the latter now considered a synonym of E. speciosa (Germain, 1856). In taxonomic nomenclature, two taxa in the same genus cannot bear the same name—a situation known as homonymy. In such cases, the older name has priority and the younger name, in this case Cobos’, must be replaced. This was done by Bellamy (2006), who proposed the new name moorei for this subspecies, resulting in the name Ectinogonia (Pseudolampetis) fasciata moorei Bellamy, 2006. To bring some level of absurdity to the situation, the subgenus Pseudolampetis was subsequently raised to full genus rank, being listed as such in the recent world catalogue (Bellamy 2008), and since Cobos’ name was not originally proposed within the genus Ectinogonia it no longer competes with Germain’s name in that genus. 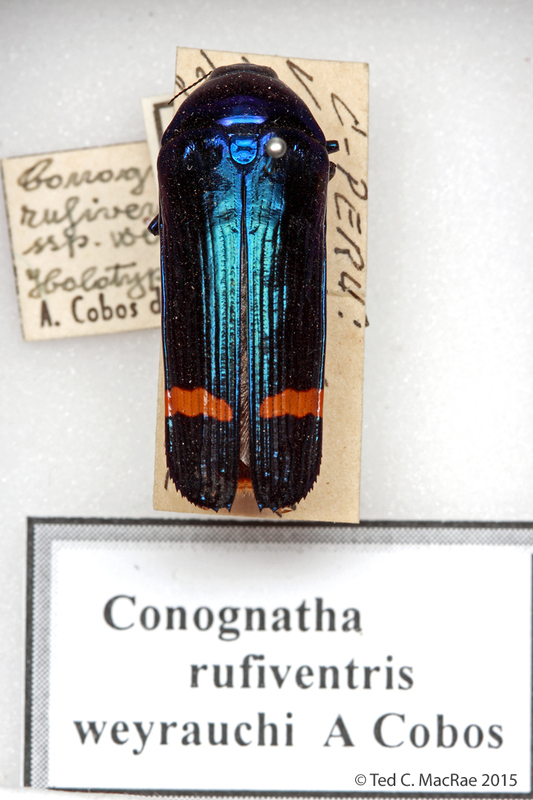 As a result, there is no homonymy and Cobos’ original name must once again stand as Pseudolampetis fasciata metallica (Cobos, 1969), while Bellamy’s replacement name must be regarded as unnecessary. This fact seems to have been overlooked when Pseudolampetis was raised to genus rank, as Cobos’ taxon is still listed in the world catalogue as “Pseudolampetis fasciata moorei (Bellamy, 2006)”! This situation is a perfect example of just how complicated these situations can be to identify, track, and update. The type locality for the unique female is given as “Chagual, 1.200 metros de altitud, Rio Marañón, en el Perú, VIII-1953 (B. Fernández leg.)”. Conognatha rufiventris weyrauchi Cobos, 1969. The taxon is now considered a synonym of Conognatha abdominalis Waterhouse, 1912. Insufficient grounds. Cobos (1969) regarded this specimen from Peru as subspecifically distinct from Conognatha rufiventris Waterhouse, 1912 from Brazil based on a suite of subtle character differences and named the taxon Conognatha rufiventris weyrauchi in honor of Prof. W. Weyrauch, who made made the holotype specimen available to him for study. Moore & Lander (2010) considered that the taxon did not represent C. rufiventris, but rather was a uniquely colored specimen of Conognatha abdominalis Waterhouse, 1912. The holotype is a male with the type locality given as “del Valle de Chatichamayo, a 1.200 m., en Peru (J. Schuiike leg.)”. Conognatha amoena amphititres Cobos, 1958. The taxon is now considered a synonym of C. amoena (Kirby, 1818). Insufficient grounds—part II. 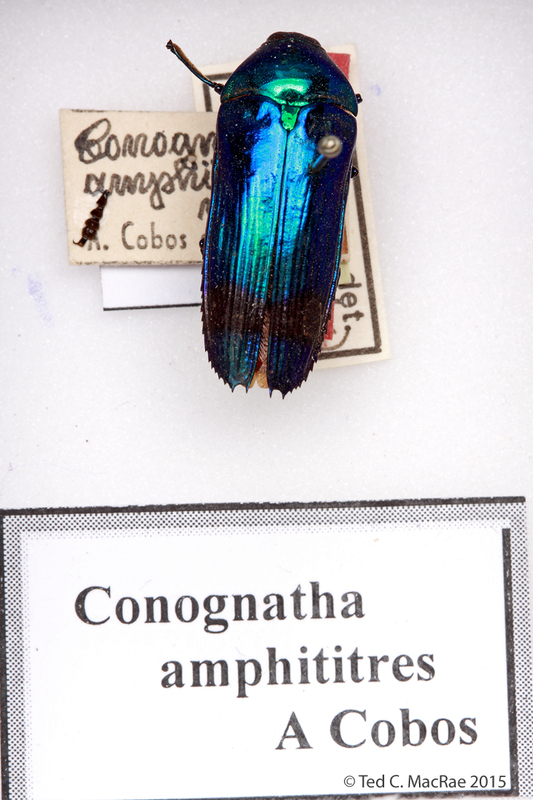 Cobos (1958) regarded this specimen from Brazil as subspecifically distinct from C. amoena (Kirby, 1818—originally described in the genus Buprestis) based on subtle characters and gave it the name Conognatha amoena amphititres (no etymology was given for the subspecies name). Moore & Lander (2006) regarded these differences as insufficient for subspecies status and placed the taxon as a synonym of the parent species. The holotype is thought to be a female with the type locality given as “Rio de Janeiro (Brasil)”. Cobos (1966) described Colobogaster weyrauchi from Peru and named it after the collector, relating it to the widespread Colobogaster cyanitarsis Gory & Laporte, 1837. The type locality was given as “Pucallpá, 200 m. alt., Perú (W. Weyrauch coll. I-1948)”. 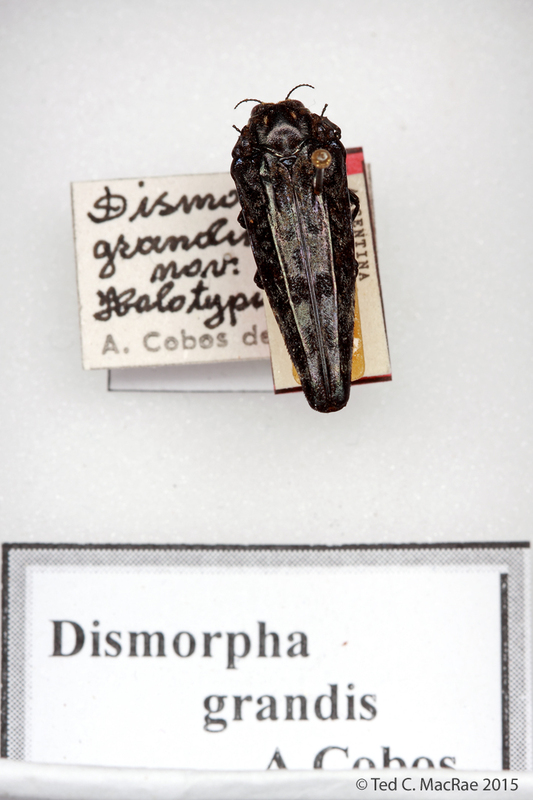 Cobos (1990) described Dismorpha grandis from Argentina in his very last buprestid publication, stating that the species had the appearance of an enormous D. irrorata (Gory & Laporte, 1839) (thus, the name “grandis“). The holotype is a male with the type locality given as “Bemberg, Misiones, Argentina (Exp. Hayward-Willink-Golbach: 12-29-I-1945)”. 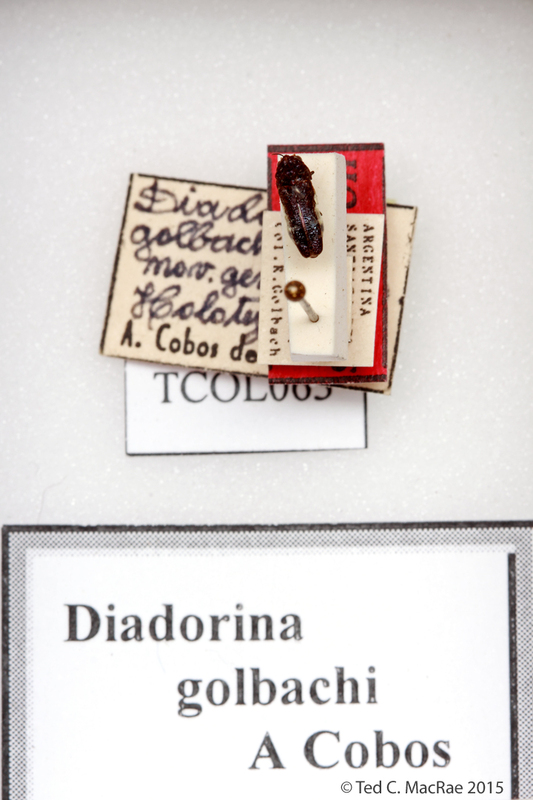 Cobos (1974) described Diadorina golbachi from Argentina as the only member (and thus the type species) of the new genus Diadorina (the genus is still regarded as monotypic), naming it in honor of the collector. The holotype specimen is a female with the type locality given as “La Tigres, Santiago del Estero, Argentina (R. Golbaeh coll. 11-16-1-1970)”. Cobos (1969) described and named this species after the river at the type locality in Peru. He related it to Pachyschelus atratus Kerremans, 1896 from Brazil and northern Argentina, stating that it differed by its distinct and less brilliant coloration and other features. Since the genus name is considered masculine, the correct species name is “Pachyschelus huallagus Cobos, 1969″. The unique holotype is a female with the type locality given as “Tingo María, Rio Huallaga, 700 metros de altitud, Peru, X-1946 (W. Weyrauch leg.)”. 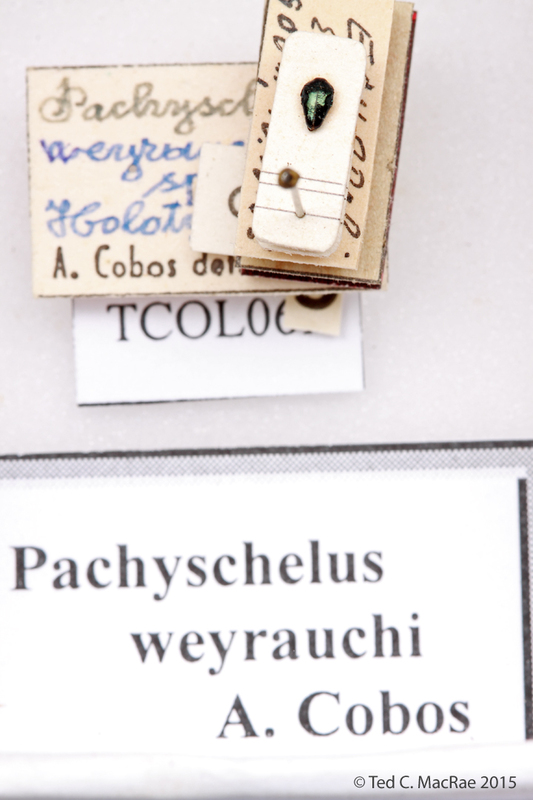 Cobos (1969) described Pachyschelus weyrauchi from Ecuador and named it in honor of its collector. He related the unique male to Pachyschelus aeneicollis (Kirsch, 1873) from Peru and Bolivia, citing differences in coloration, body shape, and surface sculpture. The type locality was given as “El Puyo, 900 metros de altitud, Ecuador, 10-IV-1958 (W. Weyrauch leg.)”. 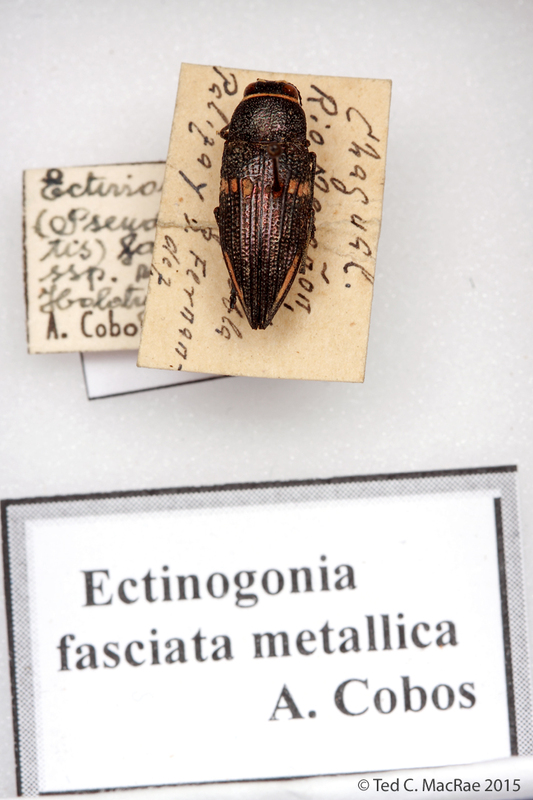 There are two additional Buprestidae type specimens in the collection (Colobogaster pizarroi Cobos, 1966 and Hylaeogena cognathoides Cobos, 1969), but they are in another drawer that we did not find immediately and, thus, I did not have a chance to photograph them. My apologies! Bellamy, C. L. 2006. Nomenclatural notes and corrections in Buprestidae (Coleoptera). The Pan-Pacific Entomologist 81(3/4):145–158 [pdf]. Bellamy, C. L. 2008. A World Catalogue and Bibliography of the Jewel Beetles (Coleoptera: Buprestoidea). Volume 2: Chrysochroinae: Sphenopterini through Buprestinae: Stigmoderini. Pensoft Series Faunistica No. 77, pp. 626–1260, Pensoft Publishers, Sofia-Moscow [details & links]. Cobos, A. 1966. Notas sobre Bupréstidos neotropicales. XV: Tres especies nuevas de Colobogaster Sol. (Coleoptera). EOS, Revista Española de Entomología 41(2-3):205–214 [pdf]. Cobos, A. 1969. Notas sobre Bupréstidos neotropicales XVII. Especies y subespecies nuevas (Coleoptera). EOS, Revista Española de Entomología 44(1968):19–43 [pdf]. Cobos, A. 1958. Tercera nota sobre Bupréstidos (Ins. Coleoptera) neotropicales descripciónes y rectificaciónes diversas. Acta Zoologica Lilloana 15:83–102 [pdf]. Cobos, A. 1973. Revisión del género Tylauchenia Burm., y afines (Coleoptera, Buprestidae). Archivos del Instituto de Aclimatacion 18:147–173 [pdf]. Cobos, A. 1974. Notas sobre Bupréstidos neotropicales, XIX. El género Amorphosternus H. Deyrolle y afines. Archivos de Instituto de Aclimatación 19:65–81 [pdf]. Cobos, A. 1990. Revisión del género Dismorpha Gistel (Coleoptera, Buprestidae). Revista Brasileira de Entomología 34(3):539–559 [pdf]. Moore Rodriguez, T. 1986. Contribución al conocimiento de los Buprestidos neotropicales (Coleoptera: Buprestidae). Revista Chilena de Entomología 13:21–29 [BioStor]. Moore Rodriguez, T. & T. Lander. 2010. Revision du genre Conognatha. Edition Magellanes 24:1–172 [introduction and generic discussion in French and Spanish; keys to species in English, French and Spanish] [order information]. This entry was posted in Buprestidae, Coleoptera and tagged Argentina, beetles, entomologists, entomology, insect collection, insects, jewel beetles, nomenclature, science, taxonomy. Bookmark the permalink.